SKOKIE, Ill. (WLS) -- Police are searching for a man wanted in connection with bank robberies reported in suburban Skokie and Mount Prospect. 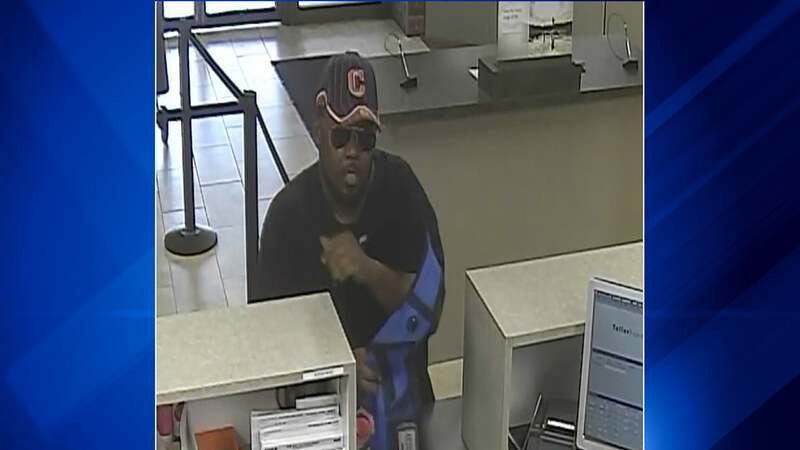 The suspect allegedly entered MB Financial bank in the 4800-block of Golf Road in Skokie around 11:48 a.m. Wednesday and put a note on the tellers counter demanding money, police said. No gun was displayed, but police say the offender kept one hand in his pocket during the robbery and then fled with an unknown amount of money. Police said they believe the same offender is responsible for an attempted bank robbery at a Chase Bank branch in the 1100-block of Elmhurst Road in Mount Prospect just after 10:50 a.m. Wednesday. In this incident, the suspect did not imply he had a weapon and did not get away with any money. The offender is described as a 5-foot-10 African American man with a large build wearing a baseball cap with a "C" logo on the front. At the time of the incidents, he was also wearing sunglasses and carrying a blue duffel bag. Anyone with information is encouraged to contact Skokie police at 847-982-5900.